The trouble with unilateral action is that it holds out no hope of real or lasting peace because of its denial of justice to the other party. I should begin this review with a disclaimer: I am a news junkie. I was raised by journalists, and the first thing I do in the morning is check my top three news sources. In the last decade, I’ve also begun to do a quick check of Twitter and whatever is dominating my Facebook feed (for actual news, not of the Kardashian-related variety). So I like to think that I am relatively well-informed about what is going on in the world, and fairly up-to-date on major developing stories. Nevertheless, there are moments in every news junkie's life when you open up the paper/webpage/link and have what can only be described as a “WTF moment.” I had one about a year ago when I opened up the New York Times app and saw that Russia had invaded Ukraine – that WTF moment led me down the rabbit hole of books on Russian foreign policy. This is the only appropriate response I have ever been able to formulate for my WTF moments: to recognize that my surprise and shock is largely a result of my own ignorance, and attempt to repair that particular problem. For the most part, what happens in the world – in various countries and between them – is only shocking if we don’t know the history that has led up to it. Knowing some of the history behind a place, people, or policy usually reveals that however crazy certain developments look on the surface they are in fact a reasonable (though not necessarily positive) evolution of what has come before. This past week I had another WTF moment, this time on the occasion of Israeli Prime Minister Benjamin Netanyahu’s success in cobbling together a coalition government. He went down to the wire, submitting the coalition to President Rivlin with minutes to spare – and that coalition is incredibly difficult to parse. In the first place, it is the bare minimum a coalition requires, consisting of 61 members (the Israeli Parliament consists of 120 members). In order to get even this minimal majority, the Israeli Cabinet has just passed a law increasing the number of ministers in the Cabinet so that Netanyahu can fulfill all of his promises. This coalition makes public the increasing symbiosis between the political and religious right wings in Israeli politics – Netanyahu’s Likud party, HaBayit HaYehudi, United Torah Judaism, and Shas, with the domestically-oriented Kulanu being the primary outlier. The new coalition was described by Peace Now as “the most reactionary in Israel’s history,” and its stability is highly questionable, with a number of promises that Netanyahu made to the new coalition members that seem quite dangerous. Frankly, however, most of these policy matters are not surprising. What gave me a real WTF moment was the appointment of Ayelet Shaked as Justice Minister and Chair of the Constitution, Law, and Justice Committee. Shaked has absolutely no direct qualifications for these posts – she has a Bachelors of Science in electrical engineering and computer science, and worked as a software engineer and marketing manager before moving into politics. Her new post puts her in a position to affect the independence of the Israeli judiciary (particularly the High Court) and to significantly impact legislation surrounding immigration. (There are indeed other problems with Shaked – but her lack of qualifications in the focus here.) So – a 39-year-old with no legal experience as Justice Minister… WTF? How are we to understand this appointment? Finding a source for the history of the Middle East is notoriously difficult, and even more difficult when it comes to Israel and Palestine. In this era of nationalism, history and ideology are almost inseparable, and in the Middle East it is history that provides the public excuse for every variety of policy, action, and invective. In the tornado of propaganda which is writing on Israel and Palestine, the writings of Avi Shlaim provide a tempered counterpoint. 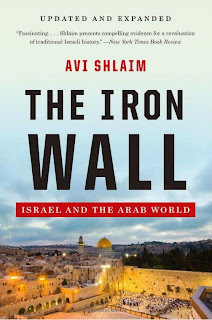 The Iron Wall: Israel and the Arab World (W. W. Norton & Company, originally published in 2001, with an updated and expanded edition in 2014) sheds some light on current events and. perhaps even more specifically, on the appointment of a Justice Minister with absolutely no experience. Shlaim is one of the prominent members of a group of Israeli historians commonly referred to as the “New” or “Revisionist” historians. Scholars affiliated with this group have been using the increasing trove of documents declassified by Israel in recent decades to rethink some of the dominant narratives of Israeli historiography, and particularly the narratives which focus on Israeli weakness and vulnerability and Arab intractability. Shlaim, an Iraqi-born Israeli/British professor emeritus of International Relations at Oxford, is certainly one of (if not the) leading lights of the New Historians group – since 1988 he has published numerous texts that challenge the accepted narratives of Israeli history, and particularly those narratives which portray Israel as a weak and struggling country attempting to come to peace with Arab neighbors that were intractable and offered it no way out. 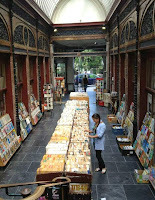 In The Iron Wall, Shlaim uses many of the documents that have been released under Israel’s policy of making government documents available after 30 years to establish that the onus for the failure to achieve peace in the Middle East does not rest only (and in some cases, even primarily) with the Arab states. Central to Shlaim’s thesis is that the early years of Israeli political life were dominated by an incredibly strong Executive, in the person of Prime Minister David Ben-Gurion. Ben-Gurion, who served as the Israeli Prime Minister and Minister of Defense from 1948-1954, set the precedent for the Prime Minister to hold other important positions simultaneously – in the newly-announced 34th Knesset, Netanyahu is his own Minister of Foreign Affairs, for example. Ben-Gurion emerges in Shlaim’s text as an enormously charismatic figure, full of almost infinite confidence in his own opinions and a remarkable ability to preserve and enshrine his own authority to take independent action. He, Shlaim writes, was a member of the activist camp that believed that a just peace could only be achieved through war – Ben-Gurion is also in many ways diametrically opposed to the Prime Minister who succeeded him, Moshe Sharett. 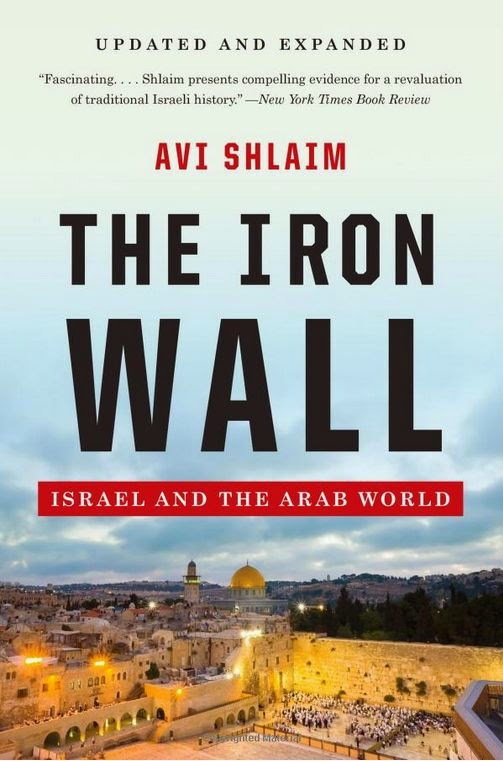 The Iron Wall makes a convincing case that the traditional narrative, in which Israel simply had no negotiating partners for peace in the aftermath of the 1948 Arab-Israeli war, is simply untrue. Of the many pieces of evidence that Shlaim uses to establish the multiple opportunities for peace that Israeli leaders dismissed after the 1948 war and the Suez invasion in 1956, the most shocking may have been Ben-Gurion’s dismissal of an overture from the then-President of Syria, Hosni Zaim; it is a rejection which had far-reaching implications not only for the Israeli-Syrian relationship, but also for Syria itself. Zaim was the Syrian Chief of Staff in 1948, and presided over the Syrian Army’s defeat in the Arab-Israeli war – he was also responsible for signing a ceasefire with Israel at the end of that war. After coming to power in a bloodless coup in 1949, Zaim became, for a short period, both President and Prime Minister of Syria. 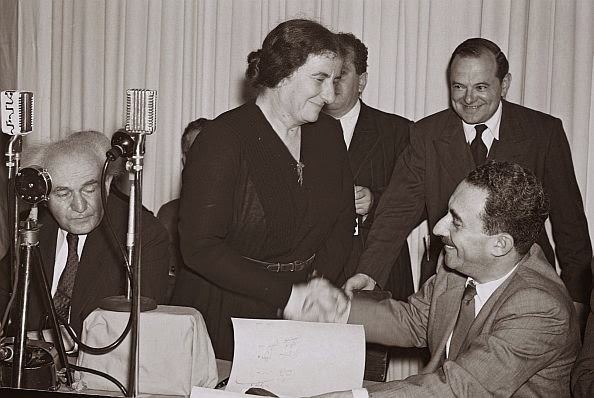 During this period, he extended an offer to Ben-Gurion for a peace deal that would involve Syria accepting and permanently settling 300,000 Palestinian refugees in return for certain (quite limited) border and water concessions. The overture was dismissed by Ben-Gurion, as was Zaim’s follow-up offer that left out his earlier demand for border concessions; Ben-Gurion, Shlaim writes, was interested only in a version of peace that fulfilled all of his conditions and required little to no sacrifice. The eventual armistice between Syria and Israel was a compromise for everyone, and involved the creation of a demilitarized zone between the two countries, with no real gains for anyone and no mention of refugees. But from a Syrian perspective, the armistice involved serious losses to its international prestige. It also solidified perceptions of Zaim’s weakness – not only had he lead the Syrian Army in its failed campaign, and publicized that failure by signing a cease-fire, he failed to gain even the slightest recompense for his country. Three weeks after the armistice agreement with Israel was signed, Zaim was himself overthrown by a coup and executed shortly thereafter. The implications of Israeli policy in Syria are far beyond the scope of Shlaim’s book, but this incident does illustrate the lack of awareness or concern on the part of the ‘activist’ wing of Israeli leaders for the responsibilities and political pressures affecting the Arab leaders. Both in the case of Zaim, and in the attempt to reach some understanding with Egypt’s Nasser later on, overtures towards dialogue and peace were repeatedly made by Arab leaders – the unwillingness of Israeli leaders to recognize that given public opinion such overtures had to be both limited and private meant that their failure was an almost foregone conclusion. In other words, while Ben-Gurion was legitimately concerned with establishing the strength and right to respect of the new Israeli state, he refused to acknowledge that real negotiations with neighboring Arab states might require sensitivity to their honor and position. To put it mildly, there seem to be certain echoes of this flattened perspective in the current Israeli PM’s foreign policy. Shlaim’s book has been criticized by more traditional Israeli historians, and certainly it provides a perspective that many people interested in Israeli history may not have encountered previously: the text is critical and unflinching, and forces readers who are invested in Israel for one reason or another to face the fact that Israel is no more a shining beacon than any other nation, in which the primarily role of the government is to pursue self-interested ends, often at the expense of other peoples. It is important to note, however, that Shlaim’s criticism is not reserved for Israeli leaders – he points out, for example, that the Arab narrative that the Six-Day War in 1967 was a war of territorial expansion on Israel’s part is completely unfounded. And even more importantly, he illustrates the ways that the declaration of the Arab League summit in 1964 that “their ultimate aim was the destruction of the State of Israel,” served to reinforce the ‘activist’ claims regarding the necessity of military force and the prioritization of defense goals. 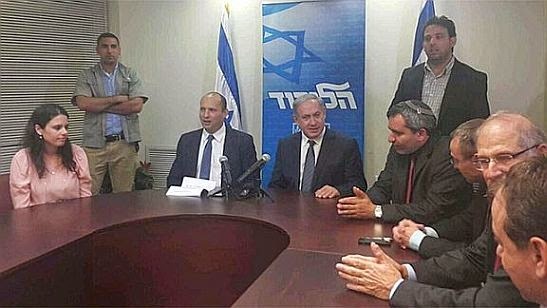 Benjamin Netanyahu with representatives of HaBayit HaYehudi, with Ayelet Shaked (far left). The Iron Wall also includes an extended analysis of Benjamin Netanyahu’s development as a force in Israeli politics. Whether or not the currently Israeli government is really "the most reactionary" in Israeli history, some historical perspective serves to make its emergence far less shocking. This is not to say that it will makes the current government appear more capable, or more reasonable – but it does ground its more extreme elements as the continuation of a long history of fairly reactionary politics. Given the dominance that incumbent Prime Minister Netanyahu has demonstrated, this seems to provide one possibility for understanding the appointments that Shaked has received (did I mention she was Netanyahu’s office manager from 2006 to 2008?). Certainly there are other reasons – that she appears to want to limit the authority of the High Court, which is very much in line with Netanyahu’s orientation, certainly seems to a factor on its own. But that Shaked’s appointment by Netanyahu echoes the appointment of Meir by Ben-Gurion is certainly something to keep an eye on. Well-written and comprehensive history books allow us to see that the world we live in is the product of conscious choices that could have been otherwise, and to consider different possibilities for understanding what is going on with the world around us. Shlaim’s work on Israel and the Middle East falls into the all-too-sparsely populated categories of the reliable and the readable, and, while his work is controversial in certain circles, it is a must-read for anyone interested in trying to parse the complicated mutations currently taking place on the Israeli political scene. 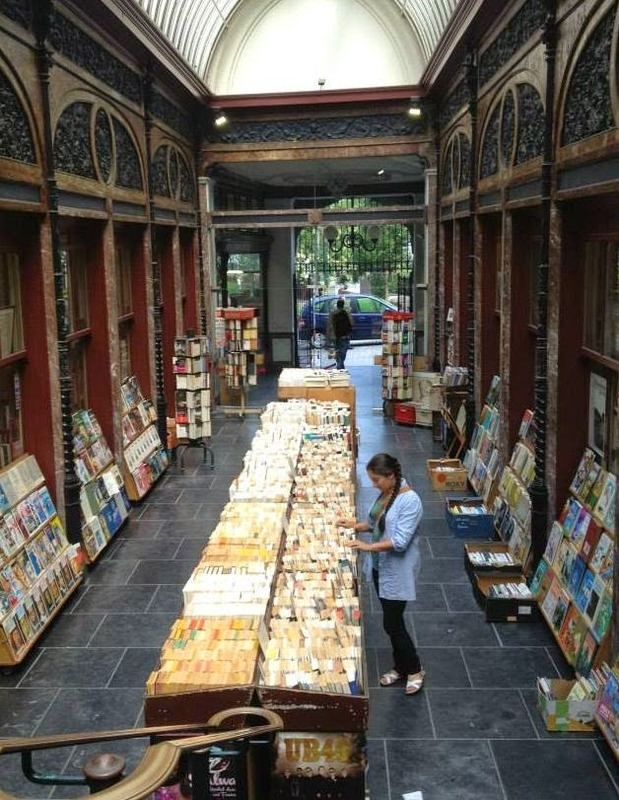 The Iron Wall provides readers not only with information and facts, but with information and facts that the reader can use to complicate their understanding of what is going on in the world today. And much like Margaret MacMillan, another leading scholar and author of popular history books, Shlaim’s text reminds us that historical narratives are never as simple as we thought – that when we hear anyone claim that “there was no other option,” it behooves us to remain skeptical. Today, “having no other option”, or ein breira, remains one of the most popular justifications for policies that cause harm (militarily, legally, or even economically) – and it is a claim that we should always stand ready to question.